Best Collections of Free Blogger Music Templates. 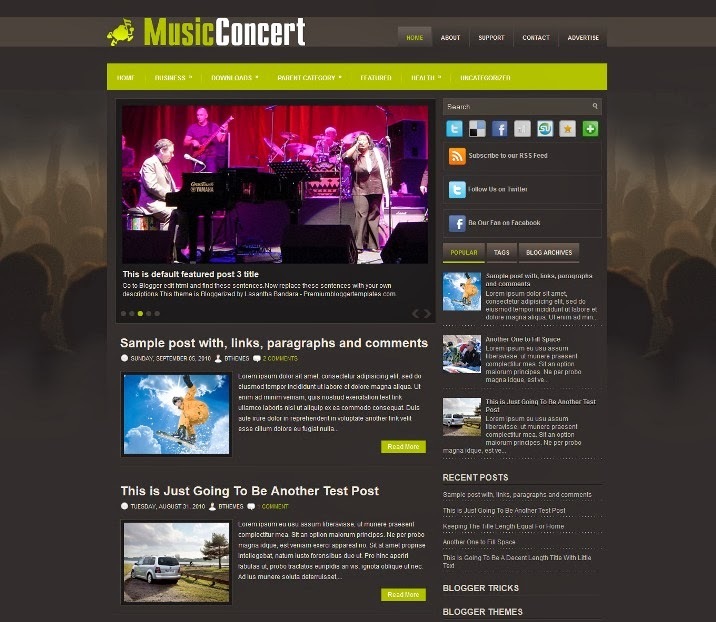 MusicConcert is a Free Music Blogger Template. Features are 1 Sidebar, 2 Column, 3 Column footer, Adapted from WordPress, Elegant, Featured Section, Fixed width, Magazine, Right Sidebar, Slider, Tabbed widget, Top Navigation Bar, Web 2.0. and more. 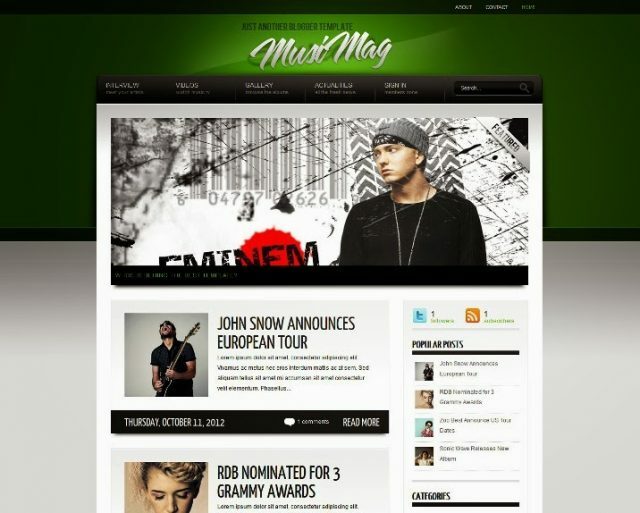 MusiMag is a Free Music Blogger Template. Features are 2 Columns, Right Sidebar, Magazine, Featured Content Slider, Fixed Width, Green Background, Dropdown Menu, Page Navigation Widget. 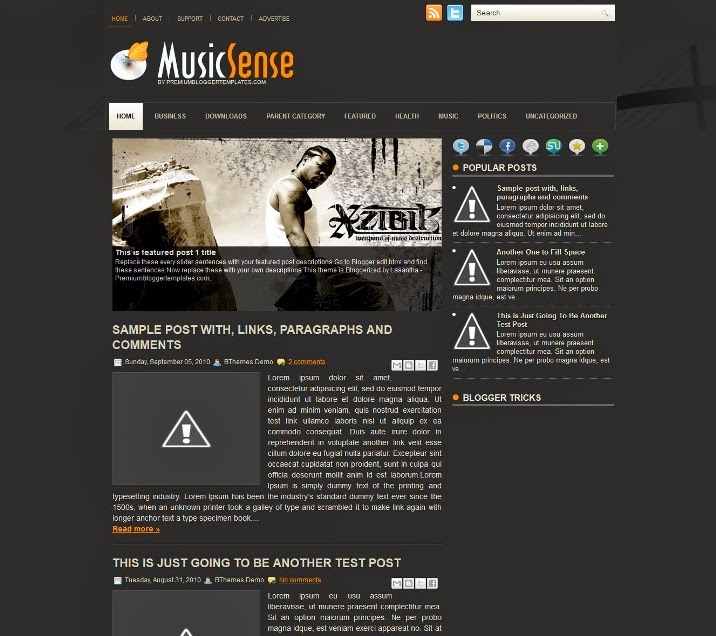 MusicSense is a Free Music Blogger Template. Features are 1 Sidebar, 2 Column, 3 Column footer, Featured Section, Fixed width, Header Banner, Magazine, Right Sidebar, Slider, Top Navigation Bar and more. 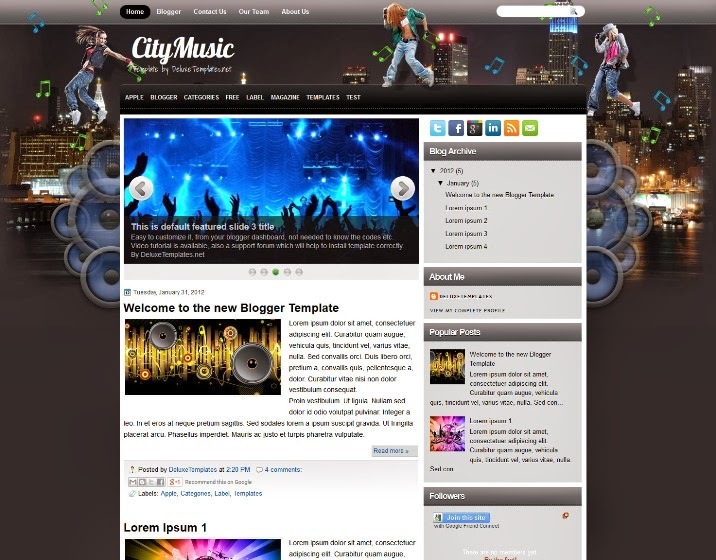 City Music is a new and free Blogger template. This template has a dark background and also it has a nice design that gives a very attractive look to this template. The background is black and has on it some box that permits you to listen music with high volume. 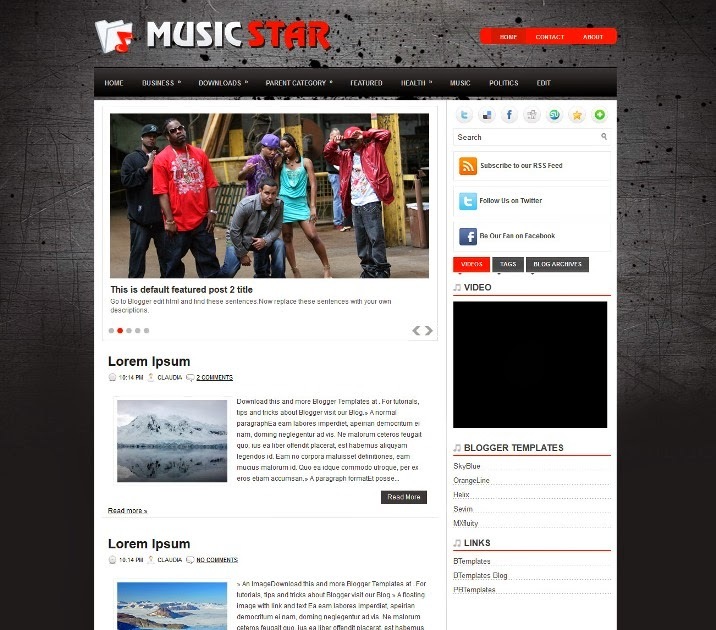 MusicStar is a Free Music Blogger Template. Features are 1 Sidebar, 2 Column, 3 Column footer, Adapted from WordPress, Featured Section, Fixed width, Magazine, Right Sidebar, Rounded corners, Slider, Tabbed widget, Top Navigation Bar, Web 2.0. and more. 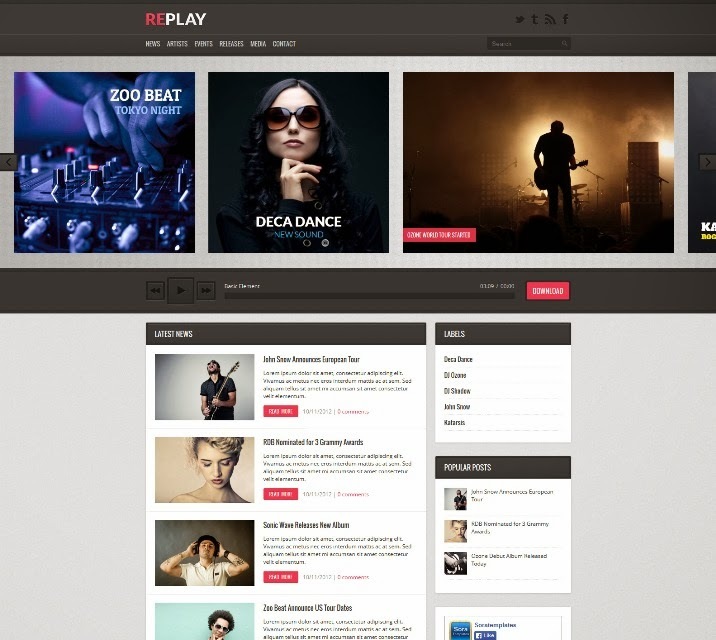 Replay is a Free Music Blogger Template. Features are WordPress Look, 2 Columns, Right Sidebar, Featured Content Slider, Fixed Width, Gray Background, Social Widget, Dropdown Menu, HTML5 Music Player, Page Navigation Widget. 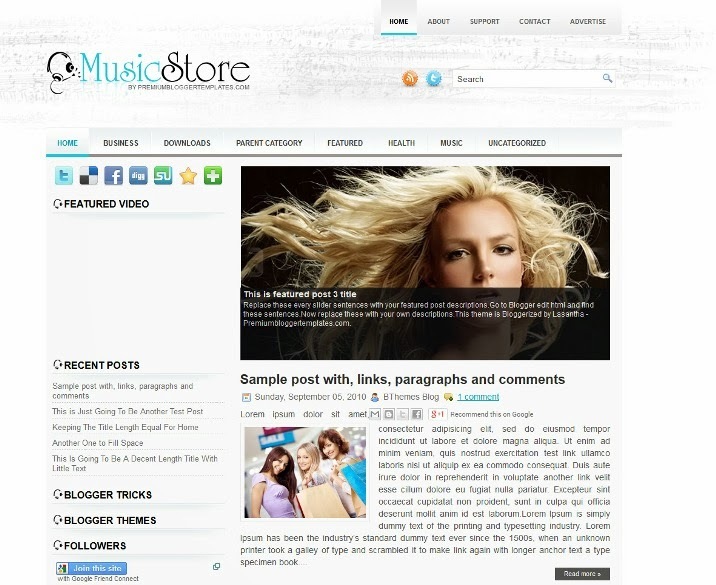 MusicStore is a Free Music Blogger Template. Features are 1 Sidebar, 2 Column, 3 Column footer, Featured Section, Fixed width, Left Sidebar, Magazine, Slider, Top Navigation Bar and more. 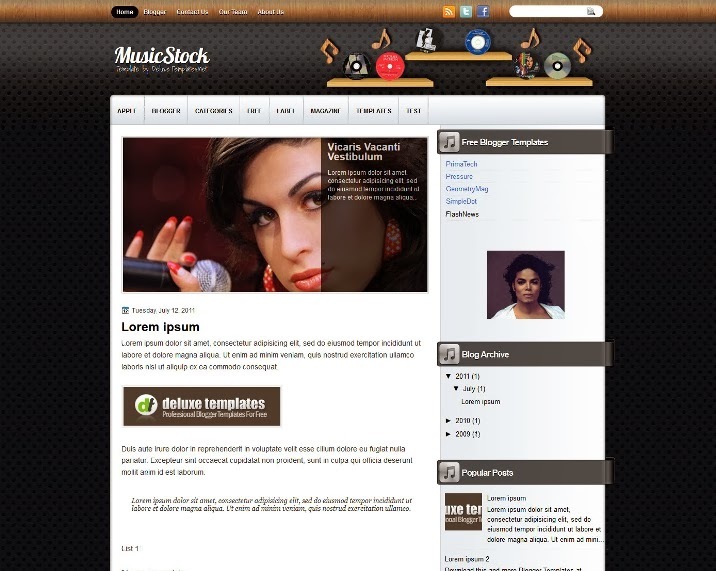 MusicStock its music Blogger template with two columns and right sidebar. This template has a dark background with nice pattern, and good images on the header. Recommended blogger template for music or movie related blogs. 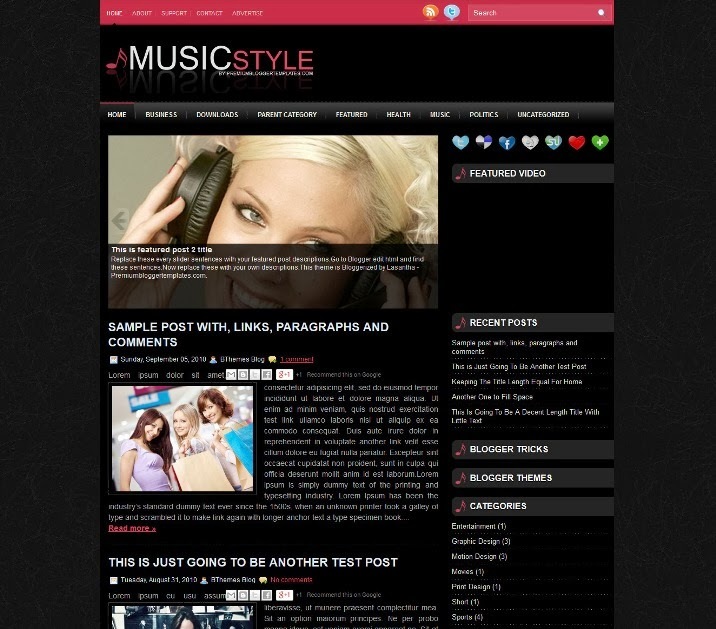 MusicStyle is a Free Music Blogger Template. Features are 1 Sidebar, 2 Column, 3 Column footer, Featured Section, Fixed width, Header Banner, Right Sidebar, Slider, Top Navigation Bar and more. 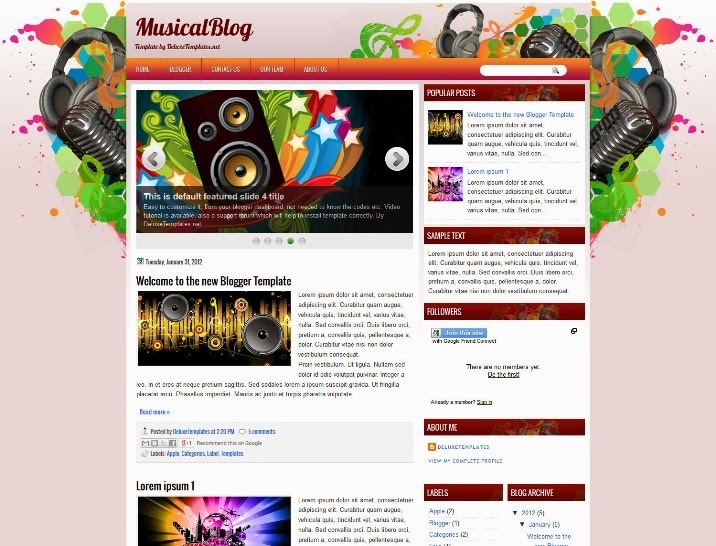 Musical Blog is a free Blogger template. This theme has 2 columns and 3 other columns in footer, lot of place to put your widgets. Features are social icons, featured posts enabled, search box on menu and more. 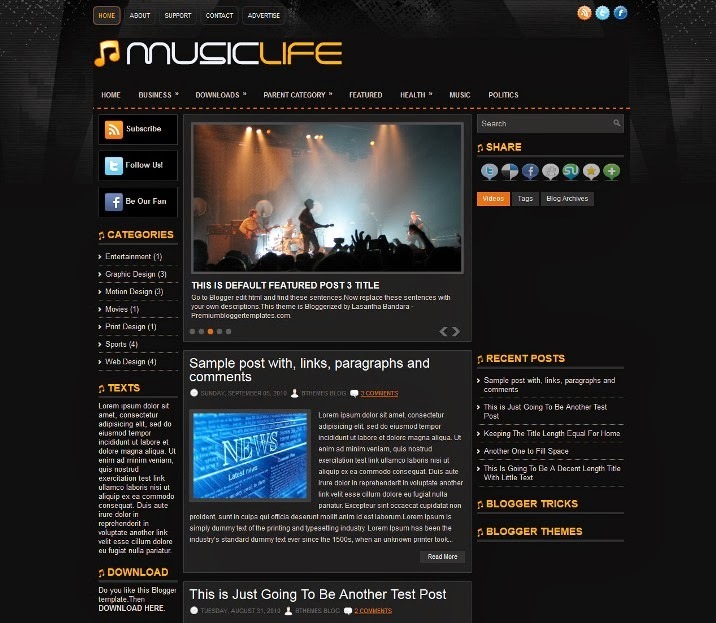 MusicLife is a Free Music Blogger Template. Features are 2 Sidebar, 3 Column, 3 Column footer, Featured Section, Fixed width, Header Banner, Left Sidebar, Magazine, Right Sidebar, Rounded corners, Slider, Tabbed widget, Top Navigation Bar, Web 2.0. and more. 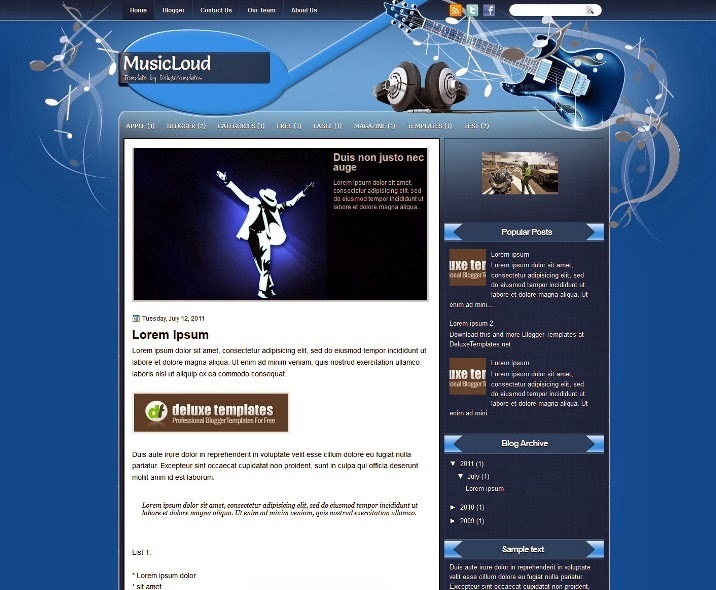 MusicLoud its a music related Blogger template with 2 columns, and beautiful vectors on header. Recommended template for audio/music blogs. Features: 2 columns with right sidebars, widgets ready, social icons, featured posts, search box. 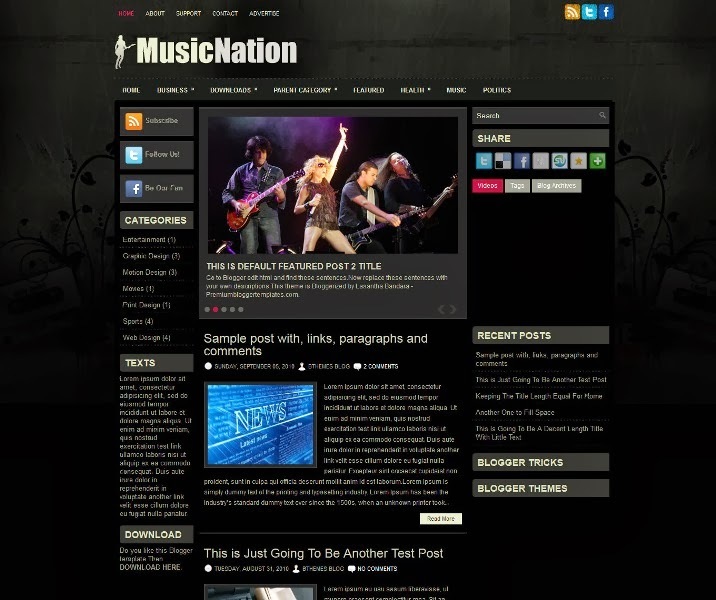 MusicNation is a Free Music Blogger Template with 2 Sidebar, 3 Column, 3 Column footer, Featured Section, Fixed width, Header Banner, Left Sidebar, Right Sidebar, Slider, Tabbed widget, Top Navigation Bar and more. MusicShow its a music related Blogger template with a nice graphics in header, colorful background and featured posts enabled. Features: 3 columns with right sidebars, widgets ready, pages enabled, social buttons, search box. 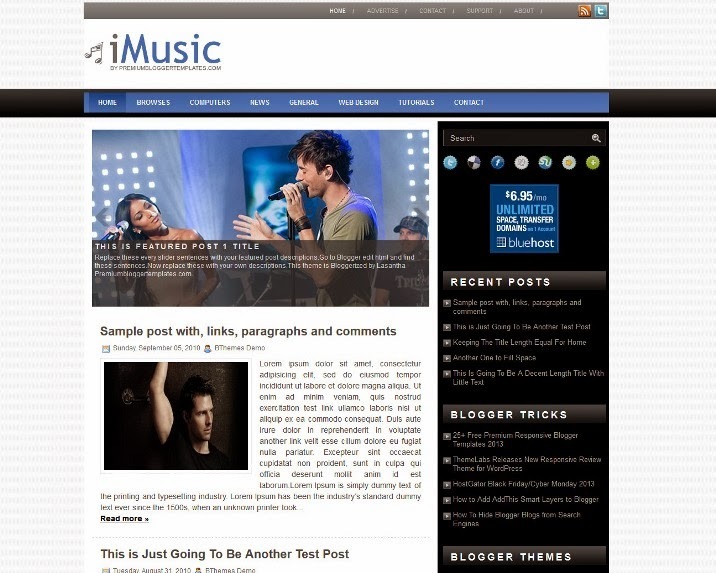 iMusic is a Free Music Blogger Template. 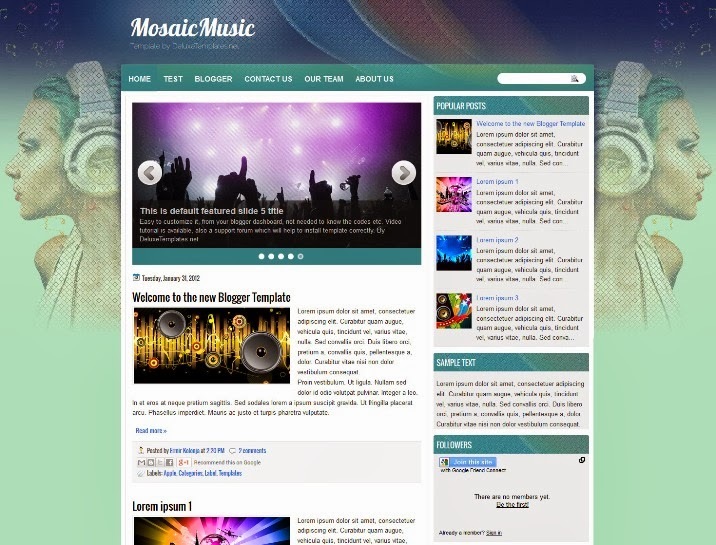 Mosaic Music is a free Blogger template for music related sites. 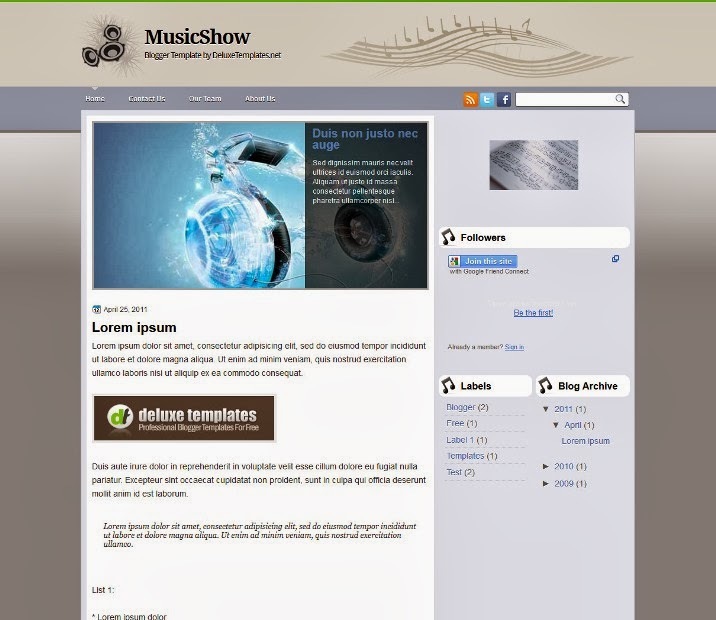 The design of this template is suitable for music blog. Listen and right about music only by using this interesting template. Mosaic Music has 2 columns and right sidebar. Music Gate is a Free Music Blogger Template with 1 Sidebar, 2 Column, Adapted from WordPress, Featured Section, Fixed width, Gradients, Header Banner, Magazine, Right Sidebar, Slider, Top Navigation Bar and more. 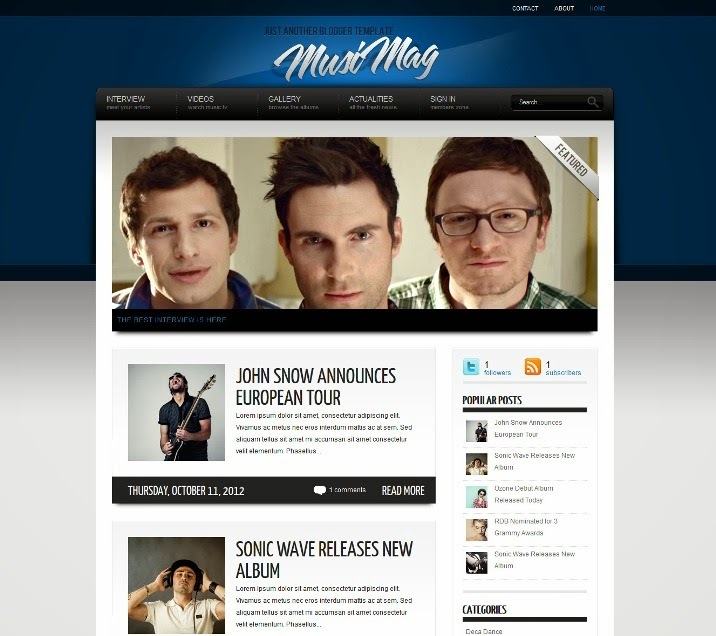 MusiMag Blue is a Free Music Blogger Template. Features are 2 Columns, Right Sidebar, Music, Magazine, Featured Content Slider, Fixed Width, Blue Background, Dropdown Menu, Page Navigation Widget. 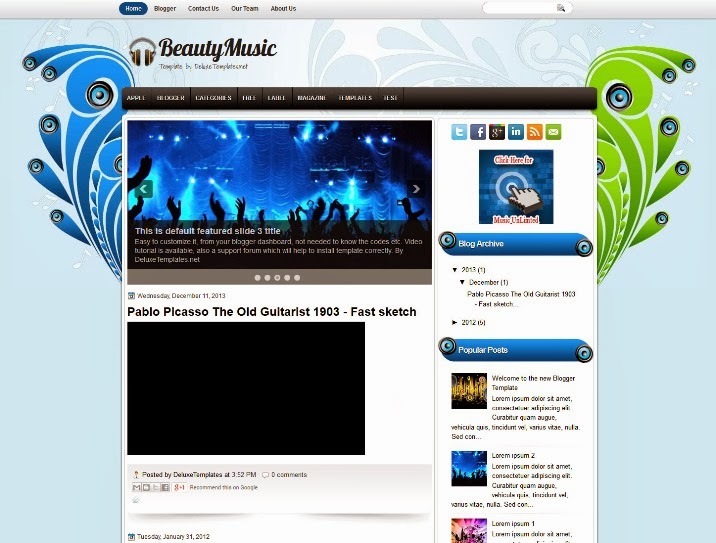 Beauty Music is a its a new Blogger template with a creative background which is colorful. The header of this template fro Blogger is simple, with top menu for pages, and second menu is for labels. Features: 2 columns with right sidebars, widgets ready, blue colors, personal blog, social icons, featured posts enabled, search box on menu. 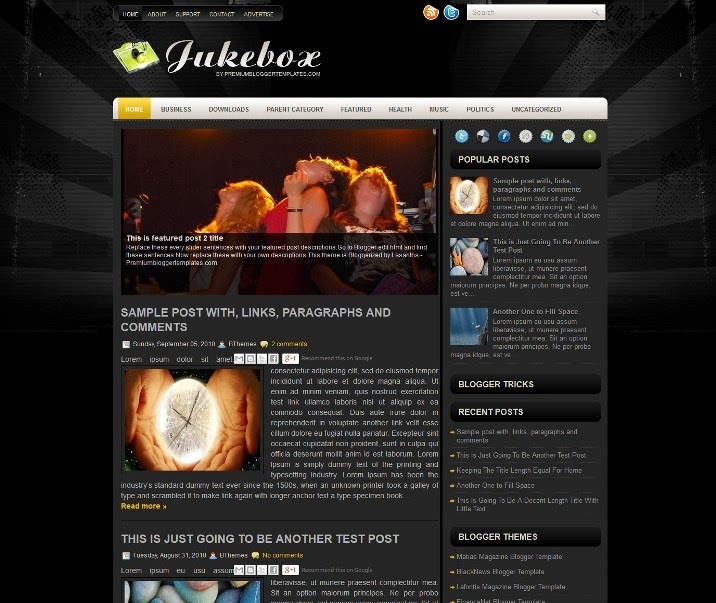 Jukebox is a Free Music Blogger Template. Features are 1 Sidebar, 2 column, Featured Section, Fixed width, Header Banner, Right Sidebar, Rounded corners, Slider, Top Navigation Bar, Web 2.0, and more.